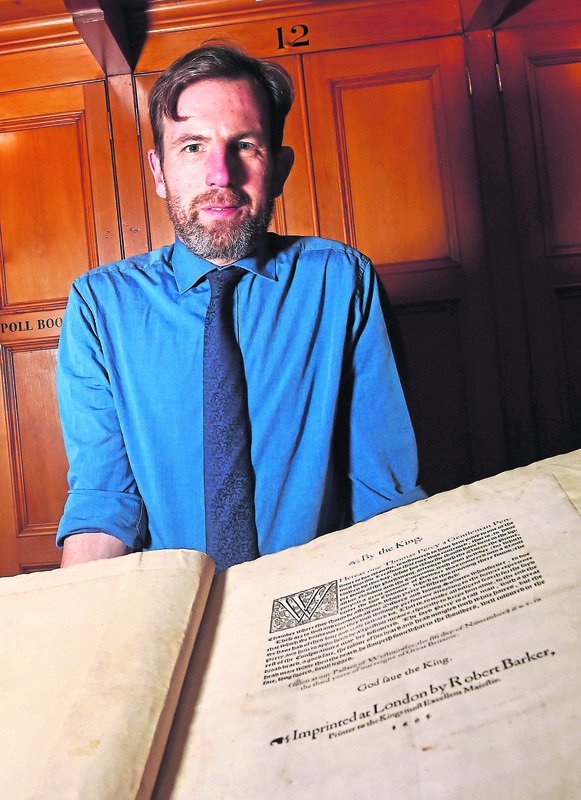 Phil Astley with the gunpowder "wanted" poster at Aberdeen Town House archive. It is one of the most famous – or infamous – chapters in British history: the assassination attempt on the British monarch and parliament by Guy Fawkes and his colleagues in 1605. And now, a wanted poster for a notorious figure in the scheme, which it describes as “one of the most horrible treasons that ever was contrived”, has been unearthed in Aberdeen City Council’s archives. Thomas Percy, a driving force behind the Gunpowder Plot, was among the men who originally convened at the Duck and Drake Inn in London in May 1604, and hatched the plan to kill King James 1 of England and VI of Scotland. He and his fellow conspirators – Robert Catesby, Thomas Wintour, John Wright and Fawkes – swore an oath of secrecy on a prayer book and subsequently moved forward with their machinations which so nearly succeeded. But their terrorist plot was foiled on November 5 when Fawkes was arrested while guarding explosives which had been placed beneath the House of Lords. To celebrate the fact the monarch had survived the attempt on his life, people lit bonfires around London and an annual day of thanksgiving for the plot’s failure has been held for more than 400 years. Aberdeen’s Lord Provost, Barney Crockett, asked the local authority whether they might have any documents relating to the incident. And he said yesterday he was thrilled by the discovery of an original document, dated 5th November 1605, urging the King’s “Officers and loving Subjects” to search for Thomas Percy. Mr Crockett said: “It’s fascinating to think that we have an original document which was issued on the very day of the Gunpowder Plot. 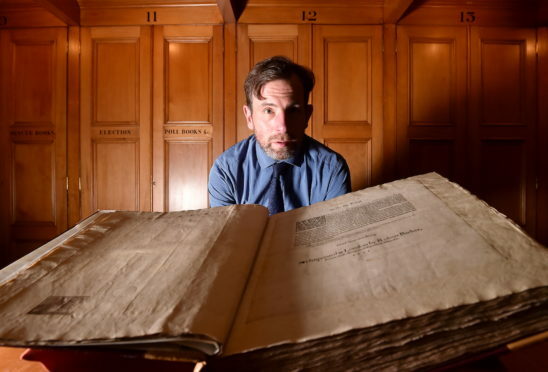 Aberdeen City and Aberdeenshire archivist Phil Astley was equally fascinated by the finding, which provides a tangible link to the early 17th century. The plan was designed to blow up the House of Lords during the state opening of England’s Parliament on November 5, 1605. This was intended as the catalyst for a popular revolt in the Midlands during which James’s nine-year-old daughter, Princess Elizabeth, would be installed as the Catholic head of state. Phil Astley with the gunpowder “wanted” poster. The plotters were Robert Catesby, John Wright, Thomas Wintour, Thomas Percy, Guy Fawkes, Robert Keyes, Thomas Bates, Robert Wintour, Christopher Wright, John Grant, Ambrose Rookwood, Sir Everard Digby and Francis Tresham. Fawkes, who had 10 years of military experience, was given charge of the explosives. But the scheme was revealed to the authorities in an anonymous letter sent to William Parker, 4th Baron Monteagle, on October 26. During a search of the House of Lords at about midnight on November 4, Fawkes was discovered guarding 36 barrels of gunpowder — enough to reduce the House of Lords to rubble — and arrested. Most of the conspirators fled from London as they learned of the plot’s discovery. Several, including Percy and Catesby, made a stand against the pursuing Sheriff of Worcester and his men at Holbeche House. In the ensuing firefight, Percy and Catesby were reportedly killed by the same musket ball, fired by a John Streete of Worcester. The survivors were taken into custody and the dead buried near Holbeche, but the bodies of Percy and Catesby were exhumed and their heads displayed on spikes at “the side of the Parliament House”. At the trial on January 27, 1606, eight of the survivors, including Fawkes, were convicted and sentenced to be hanged, drawn and quartered.